How to Uninstall Mac OS X Programs - To those of you who have just migrated from Windows to Mac, you maybe used to going to "Windows Control Panel" then "Add or Remove Programs" when removing or uninstalling applications. Mac OS X doesn't come with a program that you can use to uninstall or remove software. However, it doesn't mean that it's the end of the world because it's actually a lot easier to remove applications in Mac than in Windows. If you don't believe me, let me tell you how. Are you ready? 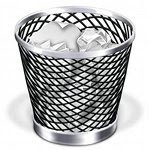 To delete or uninstall a program on Mac OS X, go inside the “Applications Folder”, find the program that you want to remove, and then drag it to the “Trash”. Congratulations, you have just uninstalled an application in Mac OS X. Easy right? But not too fast and don't just drag any program that you see to the Trash. There are Mac OS X applications that are installed by default like iTunes and Safari that you should think twice before removing. These are called bundled applications and you can identify them by control-clicking (right-clicking) them, and then you will see the "Show Package Contents" option. You will also know that it's a bundle if it has “.app” extension. It is not safe to remove this kind of application as it may cause other dependent Mac OS X applications to not work properly. If you really want to use an uninstaller (Windows-style) on Mac, you may try AppTrap. It's free and you can get it HERE. I guess that's all you need to know for now.